Once you get past the rather stupid name of the band there is some serious musicianship on ‘As we took a power nap’. As a unit this four-piece produce songs that are easier to digest than their self-proclaimed Krautrock influences could misguide and the majority of this album is tinged with improvised Rock, Jazz and indeed, Pop elements. As expected, the songs themselves, whilst simply constructed into a verse/chorus/verse fashion, are littered with obscure noises and bizarre interruptions of synth. 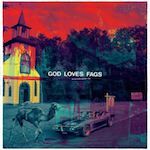 Touches of Sonic Youth and various No-Wave influences do creep in but are tempered by catchy hooks and sing-along choruses that occasionally wander into Jesus and Mary Chain territory. Ultimately this leaves GLF sat on the fence. Too weird for commercial listeners, yet far too easy listening for those with obscure tastes, I am unsure as to which market could warm to them. For me however, there is a lot to lap up on this release as a whole and enjoy, such as the Melvins-like ending of ‘Glen Wild’ and whilst not being a world-beater of an album, the lads can actually play. This entry was posted in Dense Promotion, SM Records. Bookmark the permalink.